Visiting Istanbul, Canakkale, Troy, Pergamum, Kusadasi, Ephesus, Pamukkale, Antalya, Konya, Cappadocia, and Ankara. 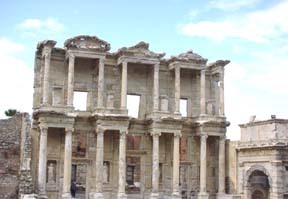 Library of Celsius This showcase of Turkey's cities of artiquity begins in magical Istanbul and travels to ancient Ephesus, Pamukkale, Cappadocia and the capital city of Ankara. Though history surrounds you, it is the warm hospitality of the Turkish people you'll remember most. Stay in Pamukkale and see its amazing white limestone "frozen waterfalls"
We have great fare from all other major US gateways, please ask us at the time of reservation. * Price per person in US Dollar based on double occupancy. Land Only rates do not include transfers.